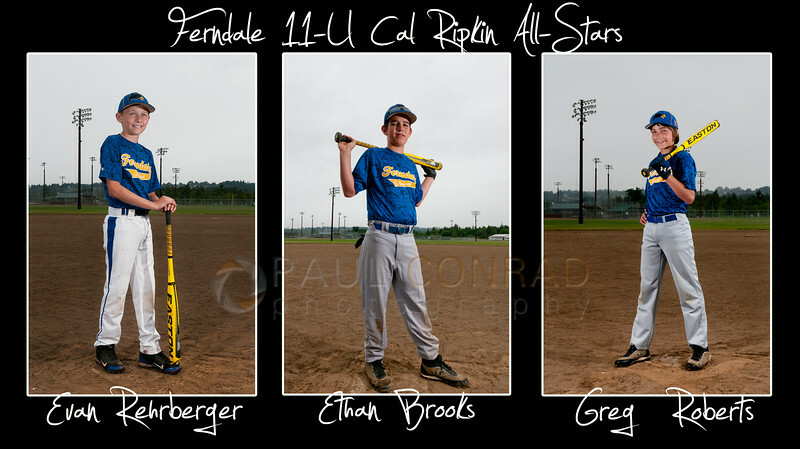 On Sunday I had an assignment to shoot 3 team members of the Ferndale U11 Cal Ripkin All-Stars. As part of the assignment for The Bellingham Herald, I was to meet three standouts and photograph them at practice. To be safe, I met the three early for a quick portrait session. Always thinking on a larger scale, I kept picturing 3 major leaguers and wanted to light them as if I was working at Sports Illustrated. Hey why not think big. They may be 11, but why let that limit how you shoot it. Using my set Nikon SB-910 speedlights and Phottix Odin TTL flash trigger and remotes, I set up a simple “studio” at home plate. 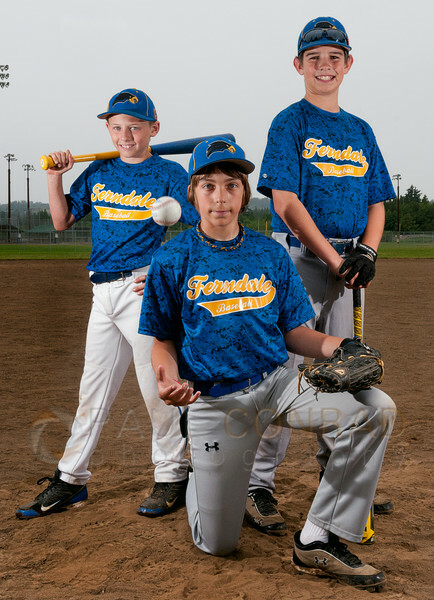 © Paul Conrad/The Bellingham Herald – Evan Rehrberger, Ethan Brooks, and Greg Roberts of the Ferndale 11-U Cal Ripkin All-Star team. As a safety, I asked one of the dads to be a test subject so I can get the light placed correctly and power output set properly. I like my strobes at a 1:2 ratio. The main light I place on the right at about 90 degrees from the camera-subject line. The secondary fill light, at a 45 degree angle on the left. I switched the main from left to right while keeping the 1:2 ratio. This gave me lighting choices to keep me from second guessing myself during the editing process. With the sky dark from clouds, I tried to set my exposure to underexpose the ambient light by one stop. But in retrospect, I should have underexposed the ambient by 2 stops. Live and learn I guess. For the three youths in one shot, I kept the lights simple: placed each strobe at a 45° angle and evenly lit. © Paul Conrad/The Bellingham Herald -(l to r) Second baseman Evan Rehrberger, catcher Greg Roberts, and first baseman Ethan Brooks, of the Ferndale 11U All-Star baseball team during practice at Pioneer Park on Sunday afternoon July 6, 2014, in Ferndale, Wash.
2 SB-910 Speedlights placed about 5 feet from subject(s). IMPORTANT!!! Set the mode for the strobes to manual. Phottix Odin TTL triggers used to control light output. They give you the ability to control the light output from the camera. Have subject turn to their left towards the main light to give dimension to the face. Adjust lighting as needed using transmitter. Swap the lights between subjects for variety. Place the left at 90° and the right at 45° for variety. I did not use a tripod to be more fluidlic. But my camera position was in a general area about 5 to 7 feet from the subject. For the 3 Subject photo, I placed each light at 45 degrees and set to full. Because the flash duration is so short (1/100th of a second or shorter), the aperture controls the amount of light when your flash is set on manual. Keep in mind this only works on manual. If you have your flash on auto , TTL, program, or whatever, this won’t work and you’ll get more confused. It must be on manual mode. The shutter control the ambient light for the most part. Use the FP mode on your strobe if you need to go higher than the camera’s highest flash synch speed. Simply: aperture for your flash, shutter speed for the ambient. It takes some practice, but it’s well worth it and gives you more tools for your photographic toolbox. © Paul Conrad/Pablo Conrad Photography – Using just two strobes with diffusers place about 5 feet from subjects. Radio remotes to trigger. Simple and easy. Photography is NOT a Spectator Sport! !